The pulsed dye laser (PDL) was often considered the choice of most vascular lesions. However, the new generation, long pulse duration, pulsed-dye laser (LPDL) V-Beam II is proved versatile that many indications are applicable far beyond the clinical scenario of vascular disorders. The LPDL delivers the energy divided into 8 sub-pulses that can be arranged both within traditional pulse duration, such as 0.45 ms and 1.5 ms and ultra-long pulse duration (up to 40 ms) to provide more uniform blood vessel damage to prevent adverse effect of purpura that was common for traditional PDL. 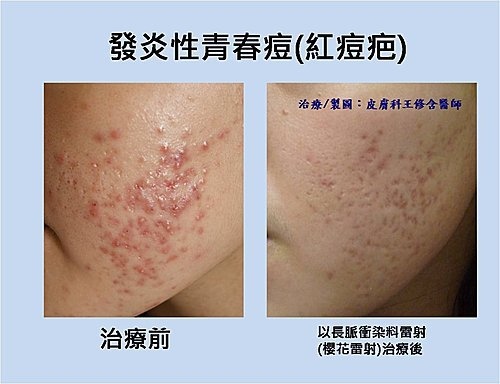 Moreover, with the tunable dynamic cooling system, the epidermis is protected and the discomfort is reduced, and thus more effective high fluencies can be used safely. The spot size can be adjusted for variable purposes. The LPDL is indicated not only for vascular conditions, including vascular malformations/ port-wine stain, hemangioma, rosacea, telangiectasia, spider veins of lower limbs, ecchymoses after facial cosmetic procedures and inflammatory acne, but also for hypertrophic scar, keloid, psoriasis, and verruca vulgaris. 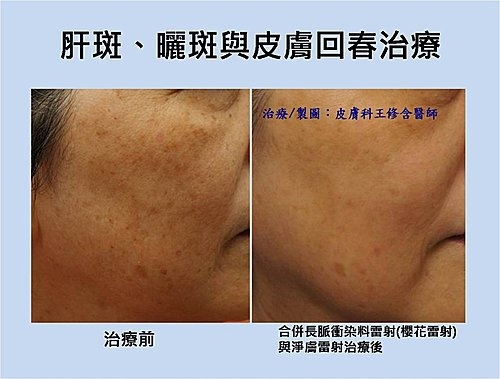 Besides, LPDL is suitable for skin rejuvenation and photodamaged skin that was proved superior to the effect of intense pulsed light (IPL). With special technique, LPDL showed its potential for pigmentary diseases, such as lentigines. 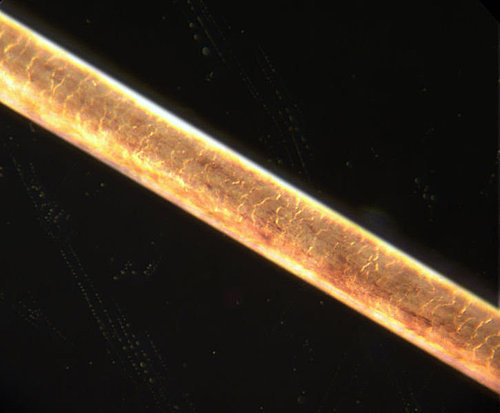 As for chloasma, recent studies revealed its vascular characteristics and can be treated with combined therapy of LPDL and Q-switched Nd:YAG laser. 2. Shiou-Han Wang, Chih-Hsin Yang, Hsien-Ching Chiu, Fu-Chang Hu, Chih-Chieh Chan, Yi-Hua Liao, Hsiao-Chin Chen, Chia-Yu Chu. Skin manifestations of gefitinib and the association with survival of advanced non-small-cell lung cancer in Taiwan. Dermatol Sinica 2011; 29(1):13-18. 3. Yi-Shuan Sheen‌, Chia-Yu Chu‌, Shiou-Han Wang,‌ Tsen-Fang Tsai‌. Dapsone hypersensitivity syndrome in non-leprosy patients: A retrospective study of its incidence in a tertiary referral center in Taiwan. J Dermatolog Treat. 2009; 20(6):340-343. 4. Sung-Jan Lin, Hsin-Yuan Tan, Chien-Jui Kuo, Ruei-Jr Wu, Shiou-Han Wang, Wei-Liang Chen, Shiou-Hwa Jee, Chen-Yuan Dong. Multiphoton autofluorescence spectral analysis for fungus imaging and identification. Appl. Phys. Lett. 2009; 95: 043703. 5. Shiou-Han Wang, Chen-Wei Wei, Shiou-Hwa Jee, Pai-Chi Li. Photoacoustic temperature measurements for monitoring of thermal therapy. Proc. SPIE 2009; 7177, 71771S. 6. Tjiu JW, Hsiao CH, Wang SH, Wu JJ, Lu CF, Chen HC. Papular clear cell hyperplasia of the eccrine duct. J Eur Acad Dermatol Venereol. 2009; 23(2):199-200. 8. Wang SH, Chu CY, Chen HH, Chang YL, Chen KY, Chiu HC. Paraneoplastic pemphigus and bronchiolitis obliterans in a patient with splenic B-cell lymphoma. J Formos Med Assoc 2007; 106(9):768–773. 9. Wang SH, Tsai TF. Several erythematous papules with a 1.5-cm sized nodule scattering on the face of an old woman. Dermatol Sinica 2007; 25(2):175-176. 10. Hong JB, Chiu HC, Wang SH, Tsai TF. Recurrence of classical juvenile pityriasis rubra pilaris in adulthood: report of a case. Br J Dermatol. 2007; 157(4):842-844. 11. Wang SH, Hsiao CH, Hsiao PF, Chu CY. Adult pityriasis lichenoides-like mycosis fungoides with high density of CD8-positive T lymphocytic infiltration. J Eur Acad Dermatol Venereol. 2007 Mar; 21(3):401-402. 12. Lin SJ, Lo W, Tan HY, Chan JY, Chen WL, Wang SH, Sun Y, Lin WC, Chen JS, Hsu CJ, Tjiu JW, Yu HS, Jee SH. Prediction of heat-induced collagen shrinkage by use of second harmonic generation microscopy. J Biomed Opt 2006; 11(3):34020. 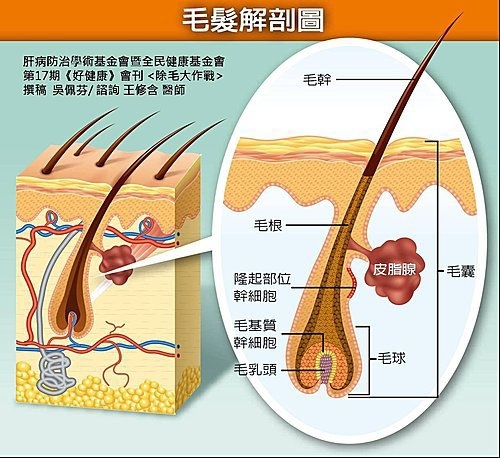 48.下列關於雄性禿(pattern hair loss ; androgenetic hair loss)的敘述何者錯誤? 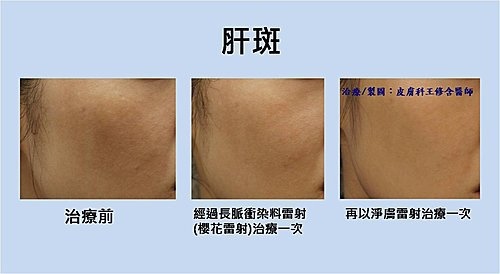 39.注射botulinum toxin後若發生eyelid ptosis，可以暫時使用下列何種藥物來刺激Muller’s muscle，以改善eyelid ptosis? 05. 26歲女性因反覆臉部皮膚的紅疹前來求診，經詳細問診及仔細的貼膚測驗後，證實病人對混合香(fragrance mix)及祕魯香(Balsam of Peru)過敏，經過醫師指導不再使用含這些成分的皮膚外用產品後，病人卻發現吃到某些食物仍然會誘發(provoke)紅疹發作，因此醫師也應該告知病人該避免以下哪些食物? 12. 當病人裝有pacemakers 或implantable cardiac defibrillators ( ICDs)需要執行electrosurgery時，下列何種治療方式最常被使用? 14.細胞之蛋白功能異常往往會導致腫瘤的發生，下列何種「蛋白功能變異」 之於「 腫瘤發生」 是屬於” Loss of function” mutation?